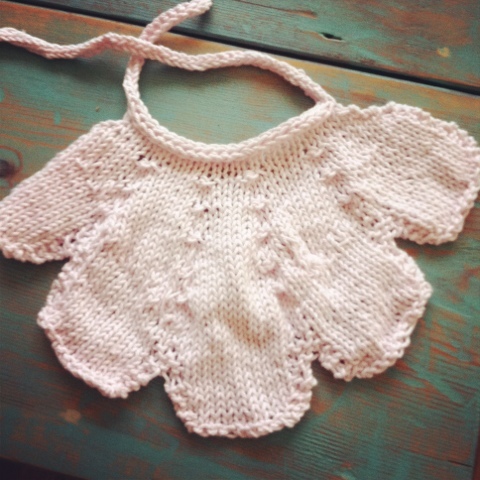 In honor of one of my dearest friends in the world, Alina Kwak, who is having a little baby girl any day now, I’m posting this picture of a baby bib I knit for her. I first met Alina at NYU and she has always been a huge supporter of my writing and career. And since she’s having her daughter very close to my birthday, I felt like it was important to make her daughter something that I could give her that I made myself. Now, I’m nearing that time in life when more and more friends and people I know are having babies. So in addition to this baby shower gift, I wanted to share one crafty gift I made her that involves scrapbooking. While I’m not a big scrapbooker, I knew that Alina and Frank (her husband) had friends and family who wouldn’t be able to attend the baby shower. So I emailed their friends and family and asked them to contribute a note or letter to the scrapbook I was making. The letters would be addressed to their baby girl. I tell you people got so creative! One couple made a Mad Libs of how Alina and Frank met. A friend had her daughter and son pose with a chalkboard that said, “We love you.” There were touching stories and silly ones. But most of all, it was personal. And someday, they can share it with their daughter. Feel free to steal this idea! When life’s moments are this big and important, it’s fun to get creative and crafty. I got the pattern from the knitting One Skein: 30 Quick Projects to Knit and Crochet by Leigh Radford. It looks complicated, but trust me, it’s really easy.